The book sat around in my apartment before I picked it up and read it, admittedly, because the thought of cleaning and letting go was a little scary (and time consuming, and hard, and took time away from you know, lazying). I finally finished the book at the beginning of the year, and decided on MLK Day that I was going to start my KonMari journey by starting with my closet. The closet was an intimidating place to start: the KonMari method was to collect every single piece of clothing you own (including accessories, socks, underwear) and dump it in one central location. You then pick up each piece, evaluating its place in your closet. It took me a total of 8 hours, 1 box of velvet hangers from Costco, 3 trips to the local Good Will, to finally pare down my close from its previous state to what I have now. So you see – I’m a little neurotic. You can actually Pinterest this and come up with a bunch of more attractive checklists. In the end, those lists were great as references but I ended up making my own on Excel. Don’t make me decide now/I’m not sure yet. After sorting each category, I either hung the “definitely keeps” back into my close or neatly folded the “definitely not keeps” into bags for the donation bin. Going back to the “I’m not sure yet” category I had to seriously think about when was the last time I wore this, would I wear it again, can I give it to someone who might appreciate it more, do I really want the piece to take up precious real estate in my closet? Have a list, and make it yours- As I went through my closet, deciding on what I wanted to keep, I referenced my excel list time and time again. It was helpful to identify what I had way too many of (white blouses) and what I didn’t have (shorts – but this is deliberate because I don’t wear shorts). This method is especially handy if you’ve been thinking about going the “less is more” route with your wardrobe. It’s okay if the lists you see online don’t match up with what you envision. Create your own list! Want a closet full of skirts and dresses? Go for it. KonMari doesn’t wear pants. They don’t spark joy for her anymore. Don’t let others tell you that you need to have dark wash skinny jeans to complete your life. Everyone’s tastes and styles are different. Go with it. 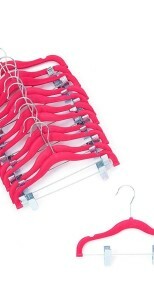 Buy skinny velvet hangers – If you don’t have these already, I suggest you get some. Costco has 35 of them for under $10. You can also get them at Home Goods, Marshall’s, or online. It doesn’t take up as much space and it’s no-slip so no need to pick up t-shirts and tank tops from off the ground. Plus, Once I used up all 35 hangers, I knew exactly how many pieces of clothing I had in my closet. I had to think extra hard to keep that 36th piece in my closet. For the record, I have 40 tops/jackets in my closet right now, and 10 skirts and pants that use hangers with clips that I got on Amazon. That brings my total pieces to 50. 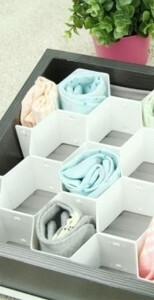 Embrace the honeycombs aka drawer organizers- I never would’ve thought my socks and underwear would’ve been folded as neatly as they are now, but it’s amazing to be able to pull open a drawer and see every pair of sock and underwear. I got my honeycomb dividers at Marshall’s for $6, and plastic organizing containers from Amazon. You can get something similar at Daiso for $1.50 as well. Take your donations out on the same day This helps you refrain from taking back anything you’ve already decided was going to the donation bin. If getting rid of stuff is difficult for you to begin with (high sentimental value, tendency to hoard, difficulty letting go) then this is imperative. If you have bags of stuff sitting around, you might be tempted to go back and retrieve something you really don’t need. Prepare yourself and set aside a full day Mentally preparing yourself and setting a date on the calendar ensures you will have enough time, and one of KonMari’s rules is “No Distractions.” I had music playing in the background to keep me sane, but no TV. Aside from eating lunch and an occasional break, I worked through the day. It was exhausting (and was so tempted to take a nap once I cleared enough space on the bed halfway through), but the result was so worth it. This is my main tops section – KonMari suggests organizing your closet in colors that go from dark to light. Here’s a look at the jackets section of my closet – also very dark. I’m really not a colors girl. Velvet hangers also come in the clip variety. These pink ones came from Amazon. I use them to hang skirts and pants. They also have grooves which are good for dresses or anything with a think strap. The black ones are from Bed, Bath, and Beyond. Here are the honeycombs! Aka a peek into my sock drawer.